With weddings becoming more and more expensive — according to CostofWedding.com, U.S. couples spend an average of $25,656 on their big day, and that figure doesn't include the cost of a honeymoon — brides are constantly looking for ways to achieve their dream day for less. Plus, this gives you the opportunity to play up the colder weather and feature unique winter wedding details that wouldn't be possible during warmer months, like a hot chocolate bar complete with marshmallows and whipped cream! "My husband and I saved money during our July wedding by having the ceremony and reception at the same site," says Nicole Nelson from Milwaukee, WI. "We had no travel costs. We saved a ton of money by utilizing the outdoor decorations, indoors." 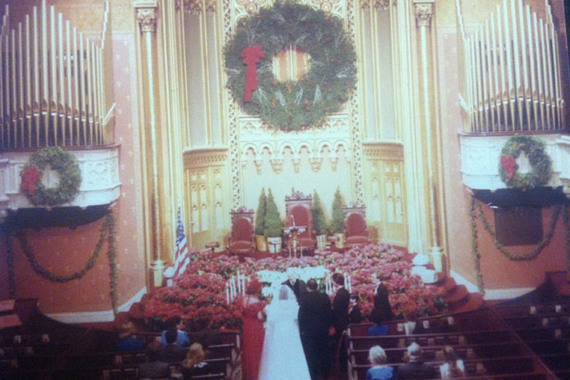 Nelson's outdoor ceremony and indoor reception were held at the same place. 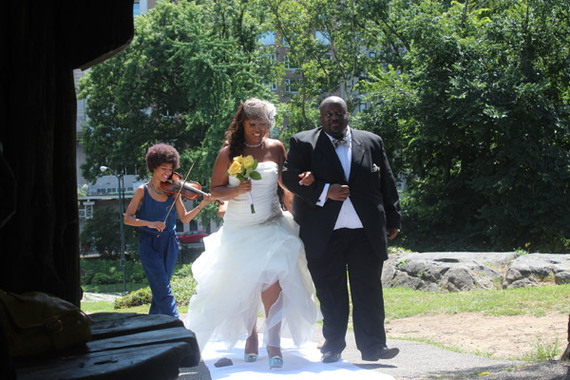 "We skipped paying the crazy banquet hall prices and decided to hold our ceremony in Central Park in New York City," says LeslieAnn Drye from Throgsneck, NY. "It was free, minus a $25 fee we had to pay to make sure no one came jogging through during our ceremony." Drye got married in a breathtaking (and budget-friendly!) Central Park ceremony, complete with live musicians. Ask your bridal salon if they offer any discounts for paying the full price of your dream wedding gown upfront, like bride Lisa Padley from Easthampton, NY did. Your wedding gown is arguably one of the most important outfits you'll ever wear, but with dresses costing up to thousands of dollars, it can be frustrating trying to find the perfect style that's within your budget. Amy Mitchell from New York City tells us she's ditching wedding favors: "Who really wants a tin of mediocre candies anyway? Instead, we will be making donations in each of our guest’s names to a charity or organization of our choice." 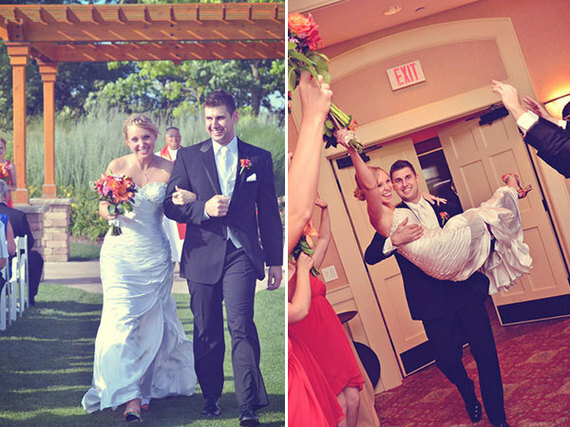 Instead of forgoing a videographer, she decided to opt out of the edited DVD footage. "We got the raw, unedited footage, and we didn't miss a thing!" she says. If you go with a basic, no-frills package, you always have the option of upgrading after the wedding. 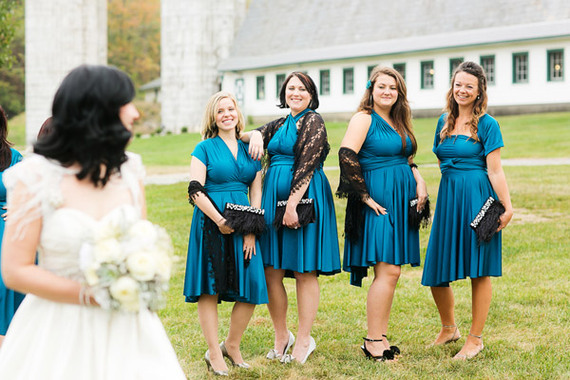 Caputa-Speranza's bridesmaids pose with their vintage purses. Enter Bridal Guide's Alfred Angelo's Ariel Sweepstakes to win the Disney Fairy Tale Weddings by Alfred Angelo bridal gown featured on the cover of our November/December issue, plus a 6-day Disney World honeymoon! 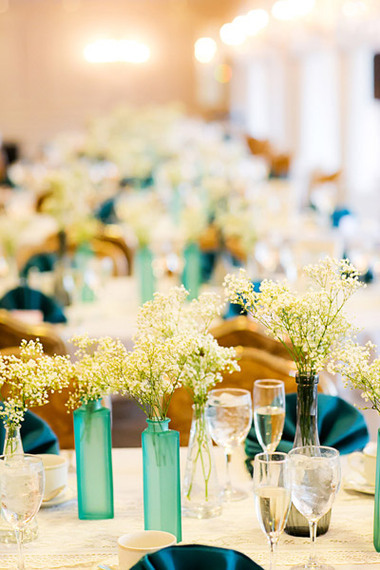 Tell us: What's the biggest way that you've cut costs at your wedding besides trimming down the guest list?